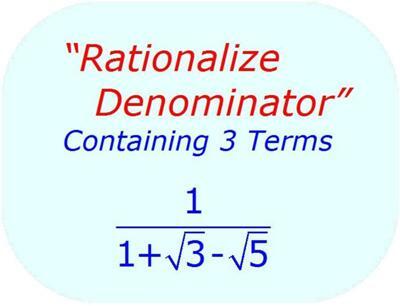 You can apply the same reasoning to rationalize a denominator which contains three terms by grouping the terms. Rationalize the denominator of the following expression. However, imagine for a moment how you would rationalize a denominator with only two terms: a + b. As you know, if the denominator contains only two terms, you could rationalize the denominator by multiplying the denominator by its conjugate: a - b.